Who you gonna call? Maybe the Ghostbusters, but if it is a 1/35 scale Eastern Front battlefield casualty that needs evacuation and you answered “Dragon, of course” you would be right. Dragon, our oh so prolific friends in Hong Kong, have recently filled an important gap in their catalogue with a new Smart Kit release of a WWII German Sd. Kfz. 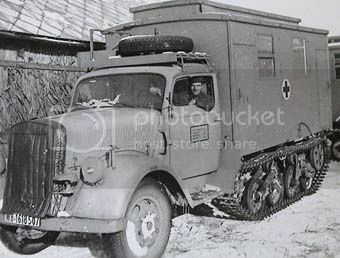 3 (technically 3a, meaning a Maultier built on an Opel chassis) Maultier ambulance, kit no. 6766 in 1/35 scale. This is the third version of the Maultier that Dragon has released; the original, plain vanilla Maultier, no. 6761, and the Cyber-Hobby Maultier with the 3.7 cm FlaK 37, no. 6768 /CH 77 kit. Now this ambulance version with, come on out on a limb with me here, probably more versions to come. We don’t have to go too far out on that limb to predict that we haven’t seen the last of the Dragon Maultier releases which is a good thing, a really good thing. What you get for your money is the usual box of light gray plastic all packed inside the standard Dragon slip top box. The top is graced with another superb Ron Volstad East Front illustration of the ambulance on a muddy road being passed through by a pair of Feldgendarmerie with a nifty motorcycle and a T-34 in the background. One thing that surprised me by its absence was the goody card that Dragon is famous for, they have chosen to instead just pack the Magic Track, decals, and PE in the box with the rest of the sprues. You do still end up with a rather full box of 23 sprues in light gray ranging in size from very small, with only two parts, all the way up to the very large that carry upwards of 50 or more parts. There are two clear sprues, one from the earlier Maultier release and one new with the windows for the ambulance van body. The decal sheet is pretty small and a bit limited, a couple of nice red crosses in perfect registration as well as the dials for the dash and the numbers to build your own license/registration plate (personally I would rather they just pick a couple of accurate ones rather than dealing with those tiny decals with no good way to keep the spacing and orientation correct). The PE sheet is also small, it seems that the better they get with replicating thinner and thinner parts in plastic the less the need for PE. It does include the Opel Blitz logo for the grill, the little wingy things for the cab door windows and a pair of hub covers for the idler wheel. You get one bag of Magic Track, to say they are small is something of an understatement. 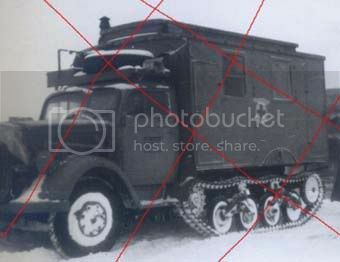 I didn’t want to bore anyone with a history lesson on the Maultier assuming that we all are somewhat familiar with development of the vehicle, but remember the tracked portion of the vehicle was left over Panzer I running gear components so the track is correspondingly tiny. You will want to be careful with parts this small, I would recommend building yourself some kind of jig or at the very least lay down some two sided tape to make your task just a bit easier. If you haven’t built, or at least cracked the box, of the first two Dragon Maultiers let me lay out a bit of information about what you see in the first 12 steps. The kit comes with a nicely done engine, the same as the earlier Opel Blitz. The frame and the undercarriage are new designs from the standard truck and are all well done. The cab and hood/bonnet are also holdovers from the Blitz 3 ton truck, but make no mistake they are superb, thin and well detailed throughout. The cooling louvers and grill are so well done I have seen grown men shed a tear when examining them closely. The cab doors are detailed on both sides and the interior of the cab gets a nice array of all the attendant gear shifters, pedals, and levers along with a nicely done dash with decals for a realistic look. The seat for the cab has a well rendered fabric look to it as well. In short, you will find this part of the build to be up to the same standard as Dragon’s most recent Smart Kit releases. Once you get beyond the Maultier sections the next 15 steps to the instructions will take you through the building of the van ambulance body. All of the parts that go along with the last half of the build are brand spanking new. Roughly it appears that about half of this kit consists of newly tooled parts. The ambulance has a fairly complete interior including 9 well done stretchers, as well as the framework to hold the stretchers and casualties if you so choose. Also, Dragon has provided a complete set of drawers and shelving for whatever type of medical supplies these vehicles would have carried. All six of the ambulance doors are detailed on both outside and inside, including door levers with the spring mechanism, detailed escutcheon plates, shades, and handles. All the doors can be modeled either in the open or closed position. In addition to all this Dragon has included a set of stairs that can be either down or folded away that access the rear of the van body. Inside are medical orderly seats which fold out and double as steps or can be left in place as seating. The skylight for the ambulance has some very well done rivet detail and include clear parts to replicate the 16 small windows which should really help to flood the interior with light. It certainly appears that Dragon tried to insure that they didn’t leave anything out inside the ambulance. Put all this together and you should end up with a truly first rate model. Years ago I scratch built a general van body for the old Italeri offering of the Maultier using a fuzzy photo as my solo reference. This kit promises to put you light years ahead of not only my poor attempt but as well as practically every earlier conversion effort. The Maultier ambulance that Dragon has created is well detailed both inside and out and deserves to go to the front of anyone’s build pile. I can hardly wait to see which variant Dragon comes up with next! Highs: A new variant of an interesting vehicle. Molding throughout is up to Dragon's high standards, plenty of detail for even the most discriminating modeler. Lows: Really tiny Magic Tracks will slow some modelers down. That seems to be the only real low point, DS tracks would be most welcome. Verdict: A perfect follow-up to the previous two Maultier kits. Should be a very popular kit. I feel your pain, hard to find anything online regarding this particular configuration. I don't which reference, Nuts and Bolts?, covers this variant in any detail. If anyone can help chime in and let everyone know. 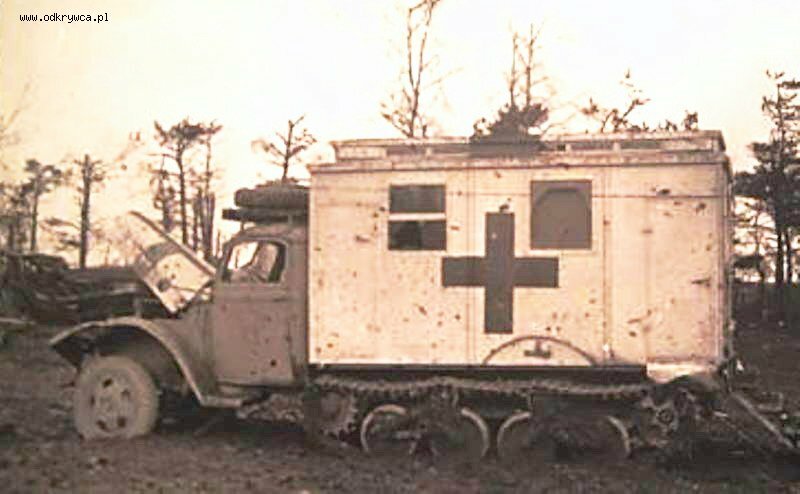 I have a feeling this might be another "Paper Panzer" so to speak, but the General Service shelter box was certainly offered on the Maultier frame and the Ambulance shelter (lower roof overall but raised clesestory down the middle of the roof was also offered,) so this combination is definately possible. If anyone feels nervous about this combo just move the ambulance shelter over onto a standard Blitz chassis and you are definately good to go! p.s. The side storage boxes that fill the wheelweld cut-outs on the Maultier version are seperate castings in the kit so they can be easily left out on the straight Blitz. Also it is a toss up on needing rear fenders on the straight Blitz. Many had them when the shelter box was installed, many did not to save on sheet metal! Ok after a brief internet search I guess this vehicle isn't so much of a Paper Panzer as I thought. This one is rough but at least it proves the vehicle existed. Looks like they painted the shelter body all white which could be another interesting detail! MEGA props FAUST for pulling up these jewels! I tried different word configurations on Google and sorted thru 20 -30 pgs with nothing. Just got done with this about two weeks ago; it is a winner, fits were great, looksa awesome. Mine's still in the stash.How about some pictures ? Ref colour schemes for German ambulances, I recently bought an issue of a French magazine which majors on the Normandy battles. This particular issue has an article on ambulances evacuated to and via Rouen during the Ruckmarsch from Normandy. Many of them are painted all white, and this appears to have been achieved in many cases by whitewashing over the Dunkelgelb, winter camo fashion, judging from the scruffiness of some of the final results. This only applies to the West, as the Russians fired on ambulances anyway, not being signatories to the Geneva Convention, so there was no point singling them out. 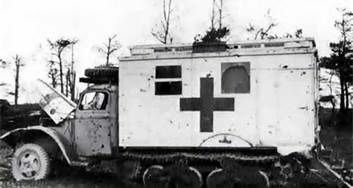 Despite the white colouring, many still got shot up by Allied "Jabos", partly because it was difficult to pick and choose in mixed columns from the air, partly because it was suspected war materials were moved in ambulances to avoid strafing!